We have all seen on TV or read reports on magazine about bacterial and viral infectious diseases developing into social problems. Some of the culprits have included influenza virus, E. coli O-157, hepatitis virus, AIDS virus, SARS virus and norovirus. Most of these diseases are transmitted through air, direct contact, carriers' blood and other media. Since many dental procedures invariably are accompanied by hemorrhage, risk of infection is high if instruments are not adequately sterilized or disinfected. Infection control involves actions to prevent in-hospital infections from these bacteria and viruses. 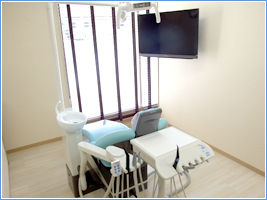 At Kanatani Dental Clinic, as part of the patient standard precaution, we replace gloves, masks and goggles after each patient to protect the patients from such bacterial or viral infections, so that the patients can feel safe in undergoing dental treatment.